Hello everyone....today is the day we have been waiting for all week....It's Release Day at Taylored Expressions...Woot!!!!!! Now you can go shopping and fill your cart to the brim with all the new goodies!!!! 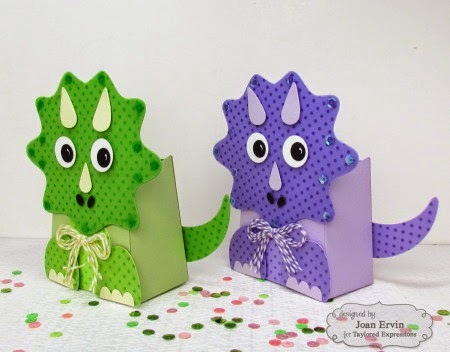 My project today features the adorable Sack It - Dinosaur and the previously released Sack It To You Die..... 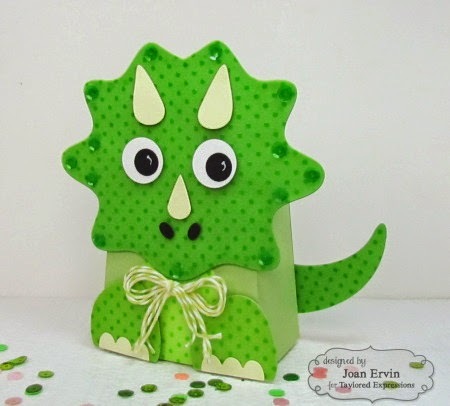 I just love this little dino die!!! The Sack It To You die was used for the sack base...one was cut out of lavender lace card stock and the green one was cut out of pistachio pudding card stock. 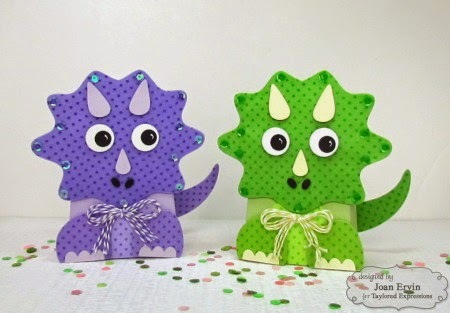 The dino pieces were cut out of the same card stock and also Sprinkles Vellum. 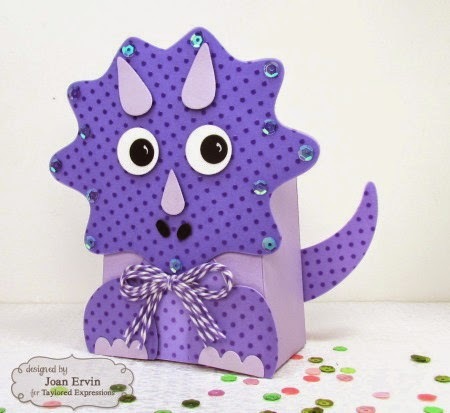 The vellum was adhered to the card stock pieces before constructing the dinos...sequins and twine for the bows were added for a little dino glam. The tails were added to the back of the Sack It bag to create a little dimension. This view will give you a little better look at the Sack It bag. Now they are ready to add some treats for some special little boys!!! Now, take a look at what the Baker's Dozen Design Team has created for you today!! Thanks for hopping along with us....have a great day!!!! These are too darn cute!! Love them. So very cute!!! Love them! awwww how totally cute.. I totally love them..
Oh *squeal* so cute and fun! Great idea for a party favor and fun colors too! Too, too cute! Love the colors you used too! OH MY Word.. This is absolutely fabulous. These little guys are too too cute and what child wouldn't want to use them! Oh, my! Just way too CUTE!